MK Dons will need to win all of their remaining games to avoid relegation to League 2, according to Scott Wootton. 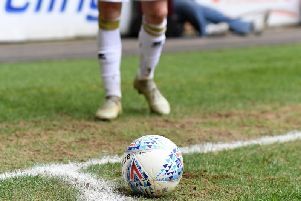 Dons were beaten 2-1 by Doncaster Rovers on Saturday, squandering a one goal lead and countless chances at Stadium MK to fall four points from safety with four games remaining. Now, with three away games and one more home game this season to salvage their League 1 status, defender Wootton believes Dons will have to win all four games and rely on other results to go their way to avoid playing in League 2 next season. "We have to fight now," he said. "We'll need a bit of luck and results to go our way. We can't control anything elsewhere, we have to win our last four games. "It's incredibly frustrating for the whole team because we're not killing teams off when we're on top. When the other team gets on top, we're conceding soft goals. If there's a game that sums up our season it was that one. At 1-0, any team at any level will get chances, they took theirs and we didn't take ours." Wootton said Dons were wasteful in front of goal, and could have had the game killed off before half time, but left Doncaster with a slither of a chance heading into the second half, something which Darren Ferguson's side took full advantage of. He said: "We knew it was a massive game, and had to be treated as a 'must-win' game, so it's sickening really. I think the timing of the first goal killed us. We had a good first half, created a lot of chances and then gave away such a soft goal. Even then, we had chances, two or three good ones and haven't taken them. And then it was another really bad one to concede." Some fans fumed at the players for not clapping them at the full time whistle, with Elliott Ward having a headed discussion with some supporters in the Cowshed. Wootton admitted he was unaware of the objections the fans had, saying he felt their boos were due to the result rather than not getting recognition from the players afterwards. "I heard their disappointment," he added. "I thought it would have been because of the result. We've lost a massive game, some of them probably wanted to get into the dressing room as soon as possible. "Fans have paid their money, they've got every right to voice their frustrations, but I wasn't aware of their frustrations. I thought the fans were frustrated at the result, rather than the players not going around clapping to be honest."